Gabby set straight by the FLOTUS ! Olympian gymnastics gold medal winner Gabby Douglas received correction on Jay Leno from no less than Mrs. Dear Leader herself ! Her crime ? Eating an Egg McMuffin while over in London ! 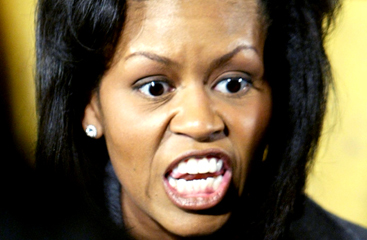 Unchecked, this rebellious girl could set back Moochelle's dietary plans to control ..... guide us all into conforming to her definitions of proper diet. This must not be allowed ! Careful Gabby.....or else Dear Leader may require you to forfeit your medals to his re-election campaign. Golly, another piece of fine work on our behalf by the bestest First Lady in History! I am right with Dear Leader, she should be paid a goodly salary for all the effort she expends to serve us. 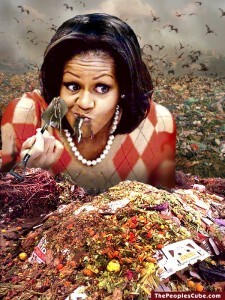 The Fat and Gluttonous Michelle Obama Criticizes an Olympic Gold Medalist’s Eating Habits! - Left to right: a Queen, her assistant, and a cow (prior to the cow being taught how to dress). Lookie what I found! Maybe next time Gabby Douglas orders an Egg McMuffin, she'll be treated to one of the FLOTUS's extra special "Angry Meals." But wait comrades- if you act now, your M.O. signature Angry Meal also comes with a new talking pull string FLOTUS doll! Pull its string and hear a myriad of memorable quotes from our beloved First Lady, such as: "..all that for a f*ckin' flag!?" or "America is just downright mean! ", or "For the first time in my adult lifetime, I am really proud of my country." and many more wonderful gems! Is this a great country or what! ?